Decluttering your home can be tough. We all like to hold on to items that we cherish or even things we have no idea what we would use them for. Learning how to properly declutter can help you to feel more comfortable in your home. Additionally, individuals with a decluttered living space typically feel less stress in their lives. 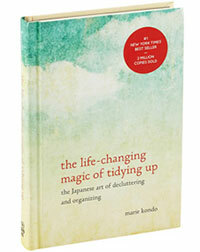 Marie Kondo is a tidying expert and the author of the successful book “The Life-Changing Magic of Tidying Up”. By learning a new level of tidying and organization, as a homeowner, you can simplify your home, via the KonMari method and rules. Most methods of tidying your home will involve a room by room basis or working little by little. 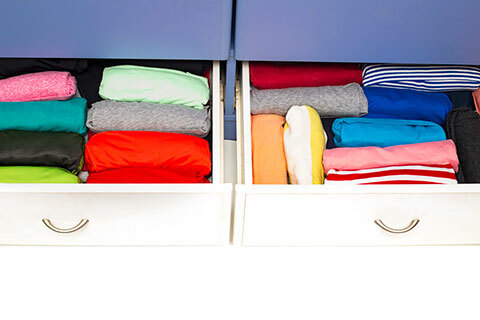 With the KonMari Method, you will learn how to work within a category-by-category system which has lasting results. The method encourages homeowners to keep items that speak to the heart. As you work through your categories, items which are discarded will have outlived their purpose. Learn how to thank these items for their purpose – and then, let them go. Through learning Marie Kondo’s KonMari method, there are rules to follow that will help you to live a more organized lifestyle. Being able to maintain this lifestyle won’t require any more large cleaning missions. Your days of vast amounts of purging to remove excess clutter will be gone. For example, Rule #1 is Commit Yourself to Tidying Up. Rule #2 is to Imagine Your Ideal Lifestyle. The remaining rules focus on discarding items, tidying by category and following the right order. The overall theme of the book and KonMari is to learn if an item sparks joy. And if it should not, learn how to let it go. Following the rules of KonMari will help you begin a new path of discovery, learning more about yourself and what you really need. Getting started with the KonMari Method will require the need for discarding items that you no longer use. When it comes to getting rid of items in the home which have outlived their purpose, having a hauling company by your side can help. Kloos Hauling & Demolition offers fast and friendly services for residential junk removal, meeting your decluttering needs. In addition to our fast and friendly service, we also review items for recycling purposes. This allows you to feel good about any waste you may be parting with, knowing some of it will be recycled into new material. Getting Kloos Hauling & Demolition to assist with junk removal ensures your property is clean and clear of clutter. As well, booking our services is easier than you think. “Make it a Kloos call” – 204.955.1188 or visit our website and email us through our web form. This simple action will be useful to you as you begin a new journey with Marie Kondo’s unique process for decluttering your home. Posted in Blog and tagged Debris Removal, Declutter, Downsizing, Hauling Service, Home Renovation, Junk Removal, Recycling.